“This video is going to generate a ton of views!” is an overoptimistic sentiment we hear too often. YouTube is the second largest search engine in the world, with 100 hours of content uploaded every minute, so it is fair to say that there’s a very minute chance that your content will be noticed amongst the mountainous number of adorable cat and baby videos. Although achieving a high number of video views is an improbable feat, it isn’t an impossible one so long as you have the right plan. There are a few optimization steps you can take to empower your video with a fighting chance. Creating great content is the key component to successfully optimizing your video(s). Without that, it’s almost impossible to naturally generate good views and drive traffic to your channel. If your goal is to obtain a substantial amount of views, make sure your content is either engaging, entertaining or informative, and most importantly, shareable. Not all of your traffic will come from YouTube itself. 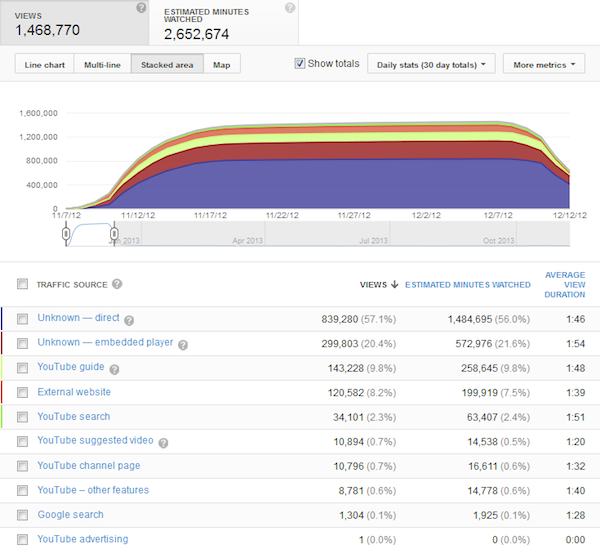 For each channel, YouTube has a great analytics tool that allows you to keep track of all of the sources. The better the content the more likely it is that other popular websites will share it. Additionally, staying on top of trends while creating your video is another helpful strategy, if people are searching for it, they might just find you. Tagging is essential; titles and tags are a major factor in making your videos more discoverable. YouTube currently has no way of understanding video content, so associating your video with text is an important way for you to rank for specific keywords. Include brand keywords in your tagging, and try your best to avoid irrelevant tags, even if it’s tempting. You can think of watch time as video’s version of bounce rate; what matters is how long a viewer stays to watch your video. A user who stumbles upon your video from a misleading tag or title likely won’t stay and really engage with your videos – this accumulates a negative effect on your channel. Google Trends is a useful tool to identify the relevant non-brand keywords that will help drive the most traffic possible to your video. It provides insights into what users are searching for on YouTube with options to source your suggestions from keywords, another YouTube video, or a diverse array of demographic information. Tags and titles may play an important role in indexing but they are not the only methods for associating text to your videos. Transcribing and uploading closed-caption files for all of your videos can also help your optimization efforts. Transcribed videos rank higher since they allow access to information in multiple formats, depending on preference and need. You can increase ranking by having your video captions or transcript translated and uploaded to translated subtitles on YouTube. Watch this tutorial for more information. It’s critical that your videos contain strong a call-to-action in descriptions and within YouTube annotations. When used correctly, annotations can improve engagement and viewership; but when used incorrectly, annotations can be distracting. Annotations not only help keep viewers on the page, but also help keep them on YouTube. They remind people to keep watching and sharing. Another way to incorporate a strong call-to-action toward engagement of your channel is through YouTube’s new “Channel Trailer.” This allows you to have a specific video that plays when a non-subscriber lands on your YouTube channel page. It’s is a chance to give them an idea of what your brand is all about, let them know why they should subscribe and watch your videos, and provide them with an action they can take to continue watching. Ensuring that videos are a part of a playlist can vastly improve your watch time . At the end of each playlist video, YouTube will automatically play the next video in the list. This will help increase your time-on-page and time-on-site metrics. If you have multiple videos you are looking to promote on social media platforms, make sure to share the complete playlist URL rather than the single video URL. It’s nearly impossible to gauge whether your videos will generate a large number of views or “go viral,” but if you utilize these steps you can definitely increase your chances. Brandon Calder from iProspect contributed to this article.